Near-infrared (NIR) spectroscopy is a spectroscopic method that uses the near-infrared region of the electromagnetic spectrum (from about 700 nm to 2500 nm). The spectral features seen in spectra collected from rock are overtones of the fundamental absorption features in the mid-infrared. These spectral features are the result of electronic and vibrational processes in mineral lattices. The position of features varies dependent upon the substitution of elements in the mineral lattice. For example, a substitution of Mg for Ca in calcite results in a shift of wavelength in the 2300 nm region and is a leading indicator that can be used to track the level of dolomitisation of the limestone. Geotek has integrated ASD’s TerraSpec/LabSpec Analyzer into the MSCL suite of systems. It can be installed on any of the following Geotek MSCL systems; MSCL-S, MSCL-XZ and MSCL-XYZ. 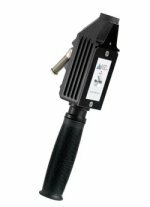 The TerraSpec/LabSpec Analyzer includes a high intensity contact probe that comes into contact with the sample to be measured. The sample is illuminated by the integral halogen light source through a fibre optic link. The spectrometer returns data from 350-2500 nm which is collected and displayed in the MSCL software alongside any other data.